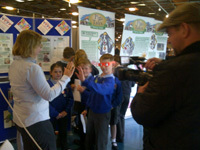 Tess Howe, our skills development manager, has been filmed today for local TV – Channel 7 – on the BPEX stand at Lincolnshire show, telling children and young people all about the pig industry. A new media star in the making? !